Your time is valuable. If you spend it measuring charts, consider the i1iSis 2 spectrophotometer with optical brightening compensation and M-series measurement illumination conditions. 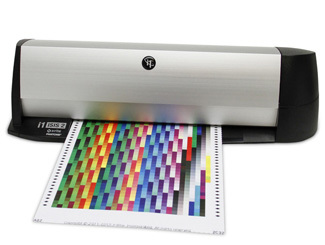 i1iSis 2 is an incredibly fast, automatic chart reader for high-production, high volume custom printer profiles. 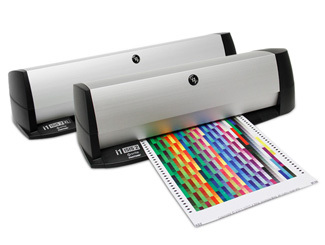 In high production environments like photo processing, large format, fine art, and high speed digital printing, measuring color test charts to keep your color management profiles up-to-date can be a labor intensive and time consuming process. The i1iSis 2 family of automatic chart readers sets a new standard in terms of speed, accuracy and handling – allowing you more time to focus on taking care of your customers. 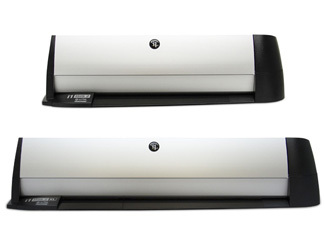 The i1iSis 2 is available in two configurations. 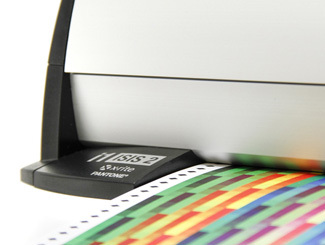 A3+ allows you to measure an A3+ test chart with up to 2,500 patches, which can be printed on a single A3 page. Scans A3+ and tabloid size charts, reading thousands of patches in less than 10 minutes. A4+ allows you to measure an A4+ test chart with up to 1,100 patches. Scans A4 and letter size charts, reading 1500 patches in just 8 minutes. Because it is built on the award-winning i1 spectral technology, you’ll capture the full spectral data of the charts you measure, assuring the most accurate measurements and profiles. In a single chart measurement cycle you can read UVcut and measurements with both NoFilter (M0) and D50 (M1). i1iSis 2 is a perfect complement to the i1 family of solutions, especially high-end applications like professional photo and proofing where consistency of measurements from instrument to instrument is mission critical. Color management has caused an explosion of opportunities for new and exotic inks, a variety of paper and substrates and new applications for those materials. i1iSis 2 is a logical extension of the digital color workflow, giving you the ability to quickly provide color support for any media, any printer, anywhere. Meet the creative demand for the latest applications quickly and easily: measure your charts and create profiles in just minutes, for any scenario, with the i1iSis 2! Switchable illumination to capture M0 (NoFilter), M1 (D50) and M2 (UVcut) in a single chart measurement cycle. A3+: Allows you to measure an A3+ test chart with up to 2,500 patches, which can be printed on a single A3 page. Scans A3+ and tabloid size charts, reading thousands of patches in less than 10 minutes... that’s three times faster than iCColor and six times faster than DTP-41. A4+: Allows you to measure an A4+ test chart with up to 1,100 patches. Scans A4 and letter size charts, reading 1500 patches in just 8 minutes...that’s three times faster than iCColor and six times faster than DTP-41.